GHC teamed up with PPRWRK which includes illustrator Mary Margaret LaVoie and photographer David Ruiz to temporarily animate Glass Street with a series of playful and unexpected images. PPRWRK specializes in wheat paste murals, an affordable and removable alternative to paint. The creative duo installed a total of nine wheat paste murals. A few of the murals promoted Glass Street’s new logo and a community event called Better Block . 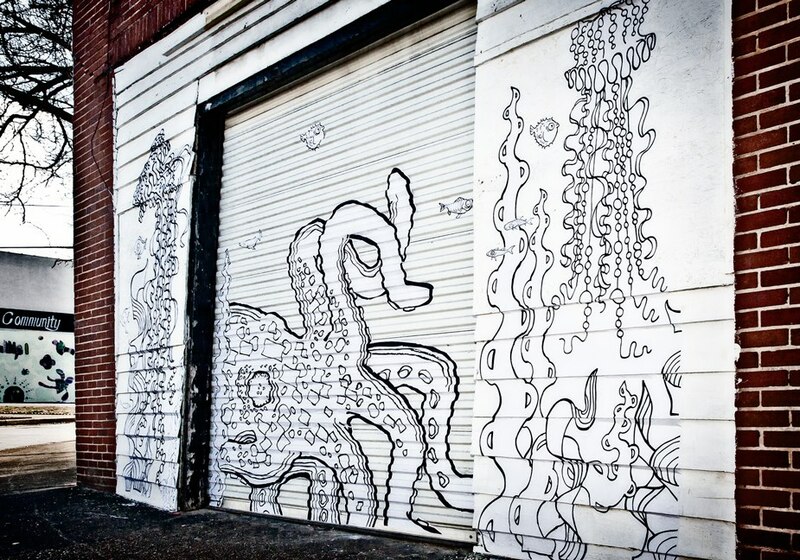 Other murals featured original artwork by PPRWRK, including scenes of whimsical sea creatures dancing across entire storefronts on Glass Street. ‘Our murals are a practice in impermanence, meant to make people smile by being a temporary change of scenery’ – PPRWRK. Lights, Color, Music-”The Pool” HERE!